I’m writing this curled up in the corner of the couch, late at night, wearing a pair of S’s thick woolen socks and drinking a cup of lemongrass tea. The house smells like toasted oats from the muesli bars I just baked, and is otherwise quiet and peaceful now that W and S are both in bed. It has been a long week, full of deadlines to meet for work, a government to be angered by, and a wonderfully energetic daughter. I spent much of today in the kitchen, making salads, baking lavender scones (recipe coming soon! ), steaming veges for dinner. I’m tired, but feeling satisfied too, and it is kind of nice being awake while everyone else sleeps. I’ve been really into incorporating fruit into my salads of late, and this Kale, Strawberry & Pear Salad is my new favourite. W has been crazy for strawberries lately, so when we got a great big punnet my first thought was how well they’d go in a kale salad. 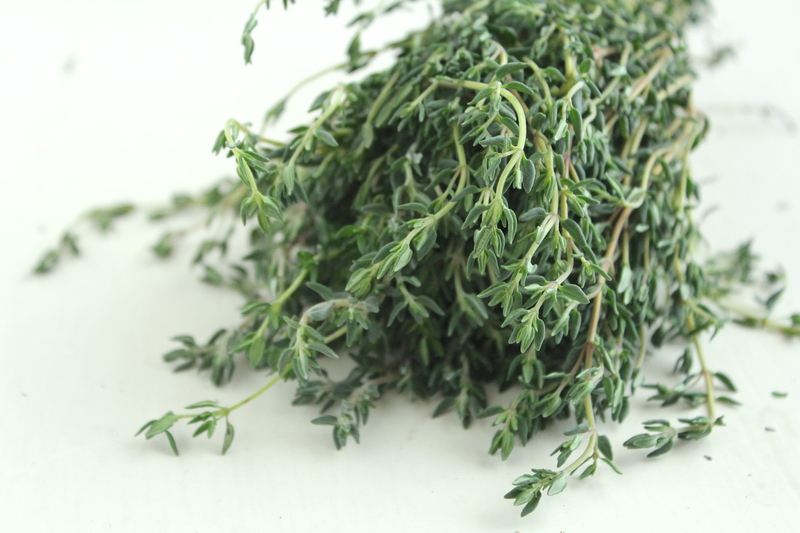 The lemon thyme dressing is one that I’ve made before – and love – and thyme just goes so well with strawberries that it was a no-brainer. In the end, this combo was perfect; the slightly bitter taste of the kale and sourness of the lemon offsets the sweetness of the fruits. You could forgo the sourdough croutons, but the toasty crunch really took this salad up a notch, and made it that much more satisfying. In fact, I liked this salad so much that I ate THE ENTIRE BOWL in one sitting. Oooh yeh. Prepare the dressing by combining the thyme leaves, lemon juice, garlic, honey, and olive oil in a small jar and blend using a handheld mixer. Alternatively, you can whisk the dressing together, but make sure you finely mince the garlic beforehand. Add salt and pepper to taste, and set the dressing aside. Wash the kale and remove the stalks. Finely slice and place in a large bowl. 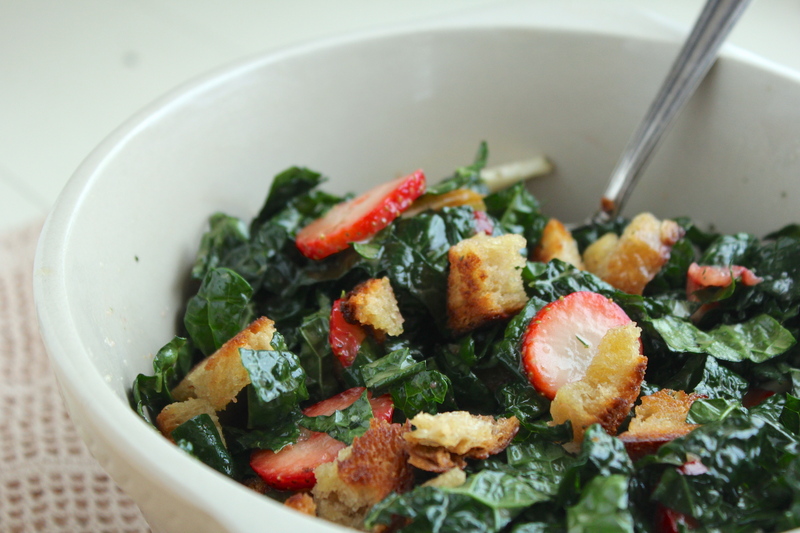 Pour the dressing over the kale and, using your hands, gently massage the dressing into the kale leaves. Leave covered for 30 minutes. In the meantime, wash the strawberries, remove the green stems, and finely slice. Halve the pear, remove the core, and cut into super-thin wedges. Add the fruit to the kale and gently mix to combine. Use your fingers to tear the sourdough bread into small pieces. Heat a generous slug of olive oil in a pan over medium-high heat and add the bread. Cook on one side until brown and toasty (approx. 5 minutes), then toss to cook the other side. Remove from the heat once the croutons are browned and crunchy. 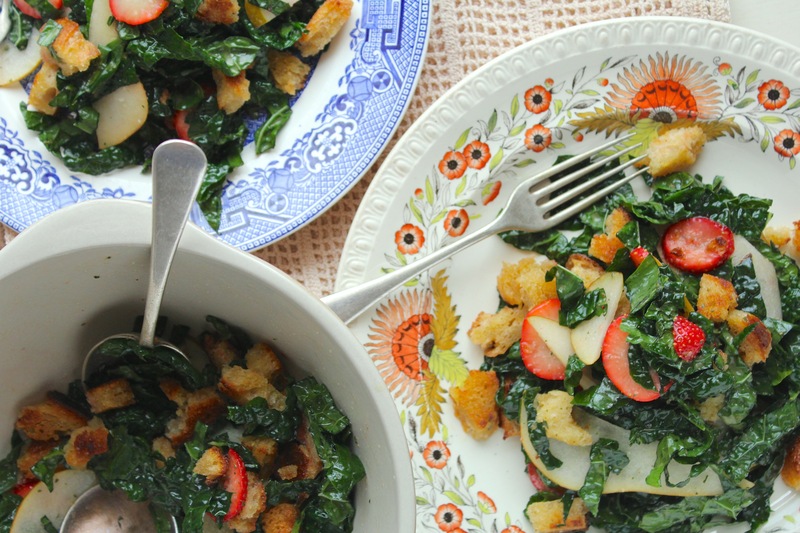 Add the croutons to the salad, mix to combine, and serve immediately. Notes: this salad is pretty sturdy and will keep for a two – three days, but make sure not to add the croutons until immediately before eating, otherwise they will go soggy. What a great idea and combo. I can’t wait to try this new Kale experience. Thank you! I love fruit in my salad too, and this looks simple and delicious. 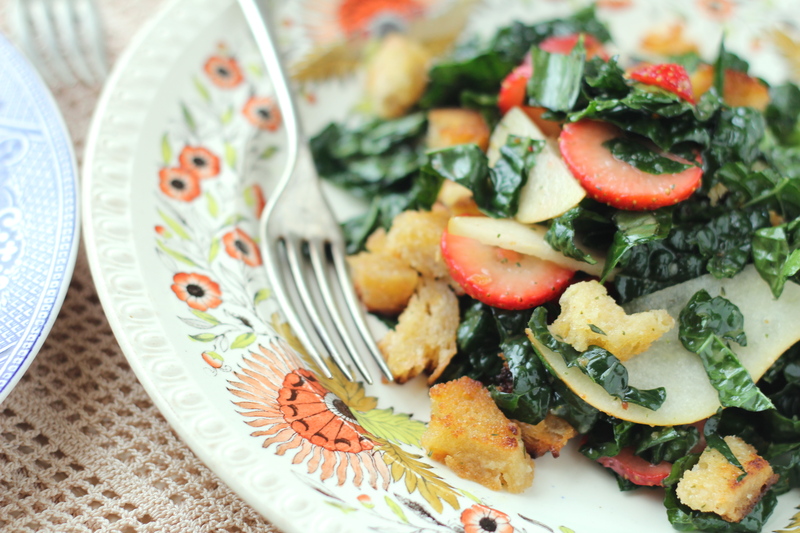 I’m not a big crouton fan but home-made sourdough croutons sound much more appealing and are a great idea! Thanks Katie. Though the croutons do go so well here, if you’re not into them I suspect that roasted almonds would also be delicious in this salad! What a sweet, delicious-sounding salad that is! I love salads with fresh fruit, they’re just so refreshing and healthy. Those strawberries look so perfect! A very beautiful salad – and so healthy too. 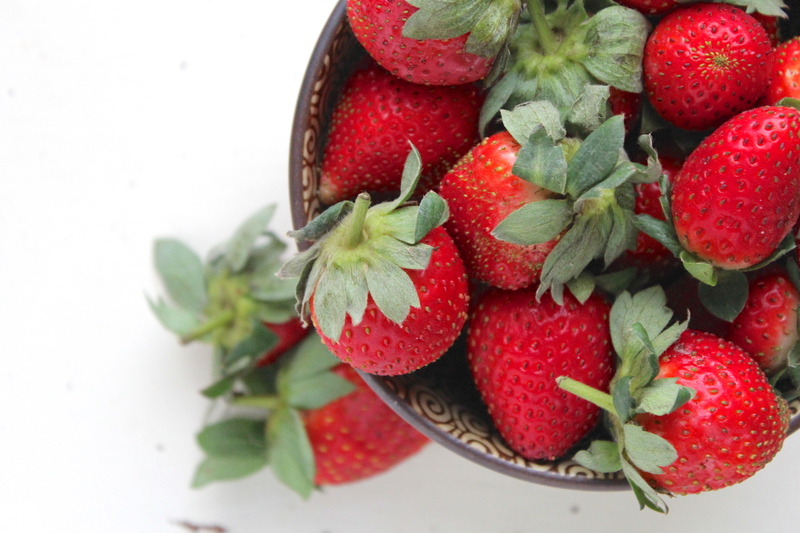 We’ve been gorging on strawberries before they go out of season!